Finding great software for your Mac can sometimes feel like a gamble. But Macworld is here to help. Every week, in the Mac Gems Weblog, I profile the best low-cost software that delivers big-time returns. (We also profile these software gems each month in the pages of the magazine.) As we approach the discovery of our 500th gem, I thought I would showcase my all-time favorites—the greatest applications I’ve uncovered in my search for low-cost software, from -favorites to - and -rated apps that also deserve some recognition. Let’s begin our week-long look at the Mac Gems Weblog’s greatest hits with 18 enhancers that will help you optimize Mac OS X. On the next page, I feature 14 of my favorite maintenance, tweaking, and troubleshooting applications. 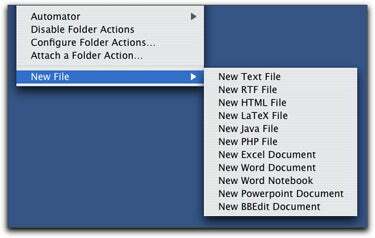 New document (here) Using NuFile, you can create a new document of your choosing right from the Finder’s contextual menu. Spotlight effect Mouseposé makes it clear to your audience exactly what you’re demonstrating, with a handy spotlight. If you’re using a Windows keyboard with your Mac—or just wish your Mac keyboard was laid out differently— DoubleCommand 1.6.1 ( ; free; Michael Baltaks ) lets you remap special keys, such as turning a Windows keyboard’s Alt key into an option key. (Tiger provides this capability as well, though DoubleCommand offers many more options.) A simple yet effective tool is EraseCMPlugIn 1.3.1 ( ; free; soft ‘O’ matic )—it gives you the ability to erase a CD-RW disc from the Finder’s contextual menu instead of having to delve into Disk Utility. GeekTool 2.1.2 ( ; free; Tynsoe ) allows you to place the output of a Terminal command, the contents of a file, or an image (such as a Webcam snapshot) on your desktop. PrintWindow 3.1.5 ( ; standard version, free; advanced version, $15; Searchware Solutions ) restores the ability to print a Finder window’s contents to OS X while also letting you choose what to print—for example, complete file and folder information, just names and the visible contents of a folder, or all subfolders. If you want to change the default format and location for screenshots without having to mess around in Terminal, Screenshots Preference Pane 1.0 ( ; $2; EGO Systems ) adds a useful pane for doing just that to OS X’s System Preferences. Service Scrubber 1.1.3 ( ; free; Peter Maurer ) puts you in control of OS X’s Services feature—a necessary task for anyone who struggles with a bloated Services menu. To take your Mac laptop’s trackpad to the next level, SideTrack 1.4.1 ( ; $15; Raging Menace ) is a replacement trackpad driver that lets you adjust speed, acceleration, and calibration, as well as assign hot corners that perform particular actions when you tap them. Anyone who enjoys tinkering with their system should embrace TransparentDock 2.3.8 ( ; $8; Free Range Mac ), which lets you customize everything about your Dock, from how it looks to how it behaves. WinSwitch 3.2.1 ( ; free; Wincent Colaiuta ) is a handy customization tool that lets you choose the appearance of the Fast User Switching menu, assign a keyboard shortcut to the login window, and—most impressive—automatically open documents or launch applications when you switch to and from specific accounts. X-Assist 0.7 ( ; free; Peter Li ) recreates OS 9’s Application menu, adding useful features such as a Shortcuts submenu for quick access to preference panes. 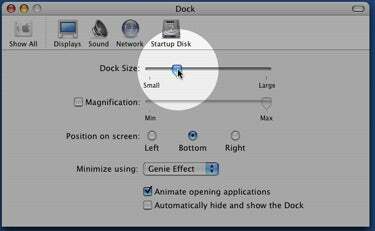 See which of our favorite bargain applications will run natively on your Intel-based Mac.